Another wonderful product to wow your friends. Top quality dinner size (20cmx20cm quarter fold, folded in half) linen mix disposable napkins available in white or cream, printed using our unique printing technology. Our print is permanent and doesn't alter the texture of the underlying fabric. Minimum order of 12. 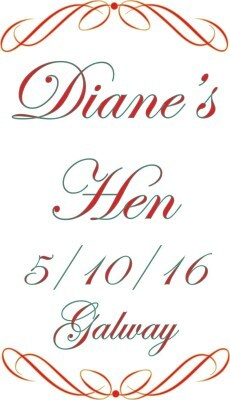 If you would like to change the colours on our standard designs enter your requirements in the comments box. To order, simply select from one of our standard designs and email through your photo (if you have chosen one of the designs with a photo) together with any additional requirements/changes to info@bumblebeecreations.ie quoting your order number. Pricing starts at 12.00 for 12, the price displayed beside the quantity options is added to 12.00. 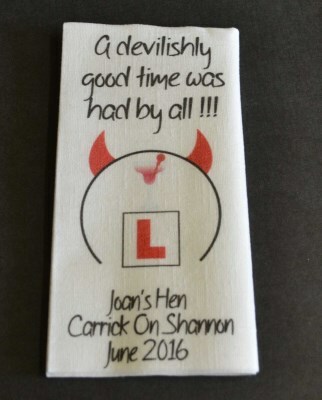 The text at the top of designs Hen Bride and Hen Devil is standard and is included as part of the design.